Your expansion tank is essential to your home’s plumbing system. But many homeowners aren’t sure when they need to replace their expansion tanks. An expansion tank serves many purposes. Maintaining it over time ensures that your home’s plumbing system works efficiently while preventing unwanted and costly issues down the line. An expansion tank is used to prevent issues related to excess pressure from your home’s hot water supply. Without it, you would be at risk for damage to your water lines, fittings, and water heater. Expansion tanks are installed down the line from the inlet valve that supplies the water heater in your home. The tank has two sections separated by a rubber valve. The top portion allows water to flow through, while the bottom portion contains pressurized air. This air pressure is what makes it possible for the expansion tank to absorb excess pressure, which is diverted away from your water pipes and heater. Your expansion tank protects you and your property from the risk of significant damage to your plumbing system. But expansion tanks can wear out. The average life of your tank can be anywhere between five and 10 years. You can extend the life of your expansion tank by making sure that your home’s water pressure matches the air pressure in your expansion tank. But in some cases, you’ll need to replace it. Knowing what to look for to determine if you need to replace your expansion tank is the first step to protecting your home. Dripping water is one sign that a valve may be blocked. This can occur as a result of mineral deposits or other debris. Some older expansion tanks lack the internal bladders used in newer models. This component is what separates the water and air pressure. As a result, air can escape the tank and enter your system’s water, which increases the risk of damage. When air enters the water’s heating system, a loss of heat can also occur. Pre-charge pressure is the air pressure that sits below the expansion tank’s diaphragm. It’s this pressure that should remain equal to the water pressure in your home’s system. If the pre-charge pressure is less than your home’s water pressure, a higher level of water will make its way into the expansion tank, which can damage the diaphragm over time. You can check your water’s pressure by using a water pressure gauge and attaching it to the drain valve of your water heater. Once you completely open the valve, you can measure and note the pressure. You can also check your expansion tank’s pre-charge pressure by knocking on the side of the tank with your knuckles to determine if it’s full of air or water. Pre-charge pressure that’s too low may be indicated when the tank is full of water. Low pressure can cause too much water from entering the tank. It could also indicate that the diaphragm is no longer functional, which means that there is nothing to prevent the water from entering. You can also remove the cover on the underside of the tank and apply pressure to the valve pin. Any water that comes out is a sign that the diaphragm has been damaged. 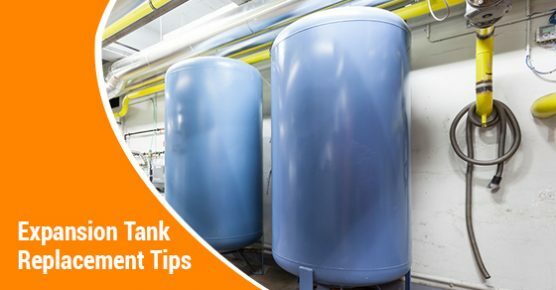 Understanding how an expansion tank works and the signs that could indicate that it needs to be replaced can prevent the need for costly repairs in the future. A functional and high-quality expansion tank will keep your home’s pipes, fixtures, and water heating system running well all year round.